184 MMS September 2017 mmsonline.com EMO 2017 September 18 - 23 EMO Hannover 2017 EMO is back in Germany this year, exhibiting machine tools, production systems for cutting and forming, precision tools, accessories, controller technology, automation, additive manufacturing, metrology and more. The following is a preview of products to be displayed on the show floor. 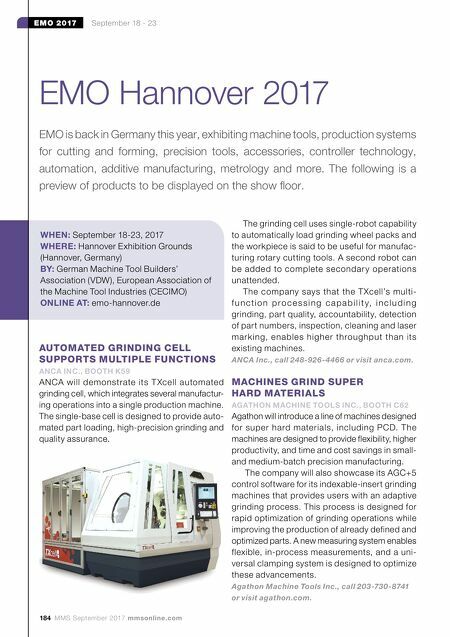 WHEN: September 18-23, 2017 WHERE: Hannover Exhibition Grounds (Hannover, Germany) BY: German Machine Tool Builders' Association (VDW), European Association of the Machine Tool Industries (CECIMO) ONLINE AT: emo-hannover.de AUTOMATED GRINDING CELL SUPPORTS MULTIPLE FUNCTIONS ANCA INC., BOOTH K59 ANCA will demonstrate its T Xcell automated grinding cell, which integrates several manufactur- ing operations into a single production machine. The single-base cell is designed to provide auto- mated part loading, high-precision grinding and quality assurance. The grinding cell uses single-robot capability to automatically load grinding wheel packs and the workpiece is said to be useful for manufac- turing rotary cutting tools. A second robot can be added to complete secondar y operations unattended. The company says that the T Xcell's multi- f u n c t i o n p r o c e s s i n g c a p a b i l i t y, i n c l u d i n g grinding, part quality, accountability, detection of part numbers, inspection, cleaning and laser mark ing, enables higher throughput than its existing machines. ANCA Inc., call 248-926-4466 or visit anca.com. 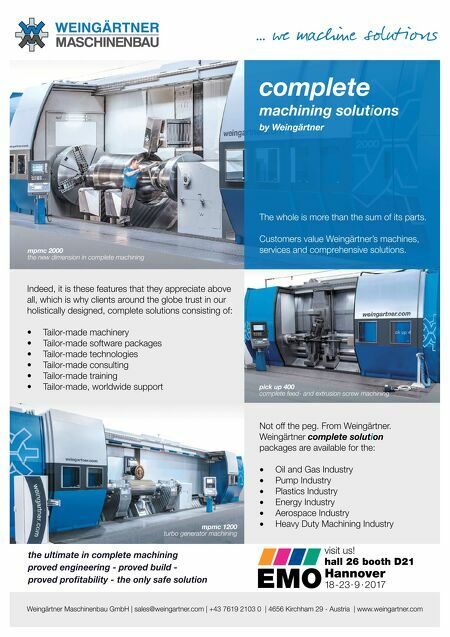 MACHINES GRIND SUPER HARD MATERIALS AGATHON MACHINE TOOLS INC., BOOTH C62 Agathon will introduce a line of machines designed for super hard materials, including PCD. The machines are designed to provide flexibility, higher productivity, and time and cost savings in small- and medium-batch precision manufacturing. The company will also showcase its AGC+5 control software for its indexable-insert grinding machines that provides users with an adaptive grinding process. This process is designed for rapid optimization of grinding operations while improving the production of already defined and optimized parts. A new measuring system enables flexible, in-process measurements, and a uni- versal clamping system is designed to optimize these advancements. Agathon Machine Tools Inc., call 203-730-8741 or visit agathon.com.